Elegance Arch Composite Doors are a simple design with a large, single panel of glass. These composite doors are ideal for those who love to let light flood in to their home. 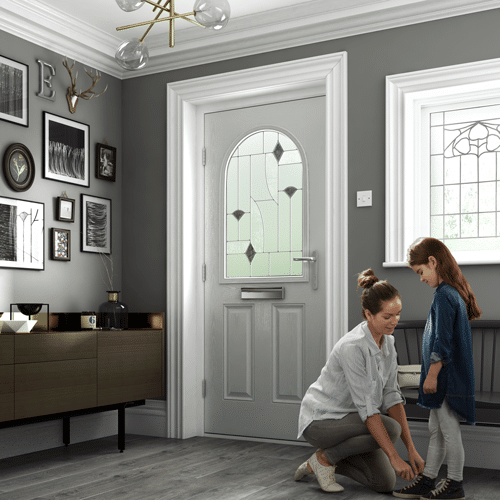 If you would like to find out more about the Elegance composite door range or other composite doors that we have available, simply call 01744 611 203 and receive a FREE no-obligation quotation when you speak with a member of our St Helens Windows Specialist Team. Plus with Up To 30% Off in our current sale, there is no better time to purchase. Call now and lock in your FREE quote for the next 12 months. You will also receive a 10 Year Guarantee with all our product, this means that we will replace or repair any faults with your door for 10 years. Design your own door now! Simply fill in your details below to receive a fantastic entrance door brochure detailing a wide range to choose from. We have a large range of external door colours to choose from with white interior as standard. This gives you the individuality that you are looking for when choosing a new composite door. Below are a selection of designs and colours to give you an idea of our door range. However we offer any of these doors in any of the colours available. Choose from a great selection of glass designs and colours. The right glass can be as individual as you and will give your composite door the extra kerb appeal that you are looking for.